The ukulele is one of the easiest musical instruments to learn. There are plenty of resources that can help you get started playing your favorite songs, from online courses and web articles to instructional videos. For greater convenience, beginners can also install ukulele apps into their mobile devices so they can have all the learning resources they need right in their phone or tablet. 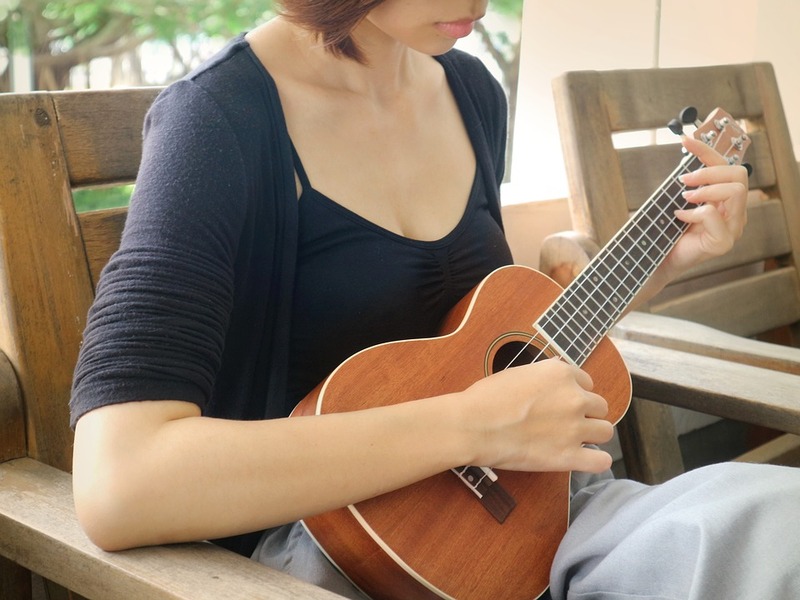 But with so many apps out there, it could be daunting for beginners to choose which one would prove to be the most useful and least stressful in helping them learn to play ukulele. Don’t worry, we’re here to help! We’ve selected some of the best user-friendly apps for ukulele beginners and highlighted their features. These apps are all easy to use and can have you playing in no time at all. So grab your beginner ukulele, install the app of your choice and start making music! This app offers a realistic ukulele simulator. This means that the screen of your device would show the strings and fretboard as they are on a ukulele so you can pluck, strum and strike strings as if you were playing on a real ukulele – thus the name. This app features a big chord database with tabs, a ukulele songbook and high fidelity sound (all of the notes were recorded using a real ukulele). You can also choose between a nylon and steel-stringed ukulele to play. Real Ukulele is a handy tool to get started even if you don’t have your own uke yet. Now who wouldn’t love having a ukulele in their phone? It’s free too! Availability: Android and iOS (under a different name). Again, it doesn’t cost a cent! This app is a favorite among those learning to play the piano, bass, guitar or ukulele. It’s packed with features to help you become the best musician you can be, from step-by-step tutorial videos, lessons on music theory and even a Weekly Challenge that lets you compete with other Yousicians around the world. This app has the ability to listen to you play your ukulele and give you instant feedback on your performance, including rhythm and accuracy. You can track your progress so you can see how far you’ve come along since Day 1 – a great motivator for beginners! Availability: iOS and Android. It’s also free to install and offers in-app purchases. If you’re the type of person who learns best the method of teaching feels like a game, then this is the app for you. As its name implies, Fret Trainer helps you learn all of the notes and chords on the fretboard of your uke. There are plenty of games to play, each one with the aim of teaching you fret and chord mastery. With this app, you can match random notes, train your ears by naming chords and practice reading notes on a staff, among other activities designed as games. There’s a progress tracker too, and each fret has its own statistics. Fret Trainer can be used for learning not just the ukulele but other stringed instruments as well, like the guitar, bass, banjo and mandolin. Availability: iOS and Android. It’s free with in-app purchases so you can fully unlock an instrument. If you’re familiar with or have come across the YouTube channel The Ukulele Teacher by Jon Howard, this app was developed in conjunction with that. It has an extensive chord library, a reverse chord lookup feature, a chord progression tool with a built-in metronome, a comprehensive scale library and a video library where you can search for ukulele lessons from The Ukulele Teacher. It’s got everything beginners need to learn, and the lessons are clear and easy to follow. Availability: iOS and Android. It’s free and offers in-app purchases (you can upgrade to the PRO version). Those are the apps we recommend for ukulele beginners. We know that people learn differently, so we recommend giving each of these apps a try. They’re all free anyway, and if you find something that works well for your learning style (and your device), then it’s worth shelling out some cash for PRO features. Have fun and let us know how your ukulele learning journey goes!